If you thought bulkheads were simple boxes made to hide the utilities serving your washers and that their design did little more than hinder your access to the back of those machines, think again. High Mark has brought the bulkhead to new levels—delivered ready to install, shaving time and expense down considerably. They are also designed with function in mind, giving easier access for servicing your equipment. Standard widths are 14.5", 22.5" and 30", but we also offer a 36" option for those larger projects. Each bulkhead is built to your specifications, based on the need of your equipment mix and the desires of the laundry owner. We offer everything from standard quarter-turn ball valves and galvanized tube steel frames to optional access doors and drain troughs, setting our bulkheads apart. And we pride ourselves on finding solutions to your common installation problems. 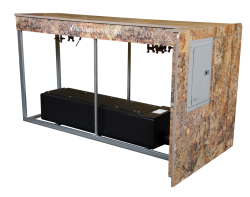 Because our bulkheads carry a UL listing, they can be financed and depreciated with the rest of their equipment.